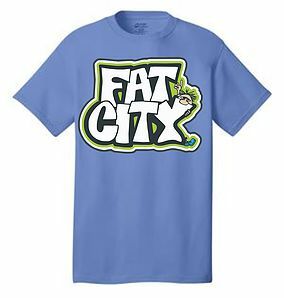 Fat City Screen Printing & Embroidery, “that T-shirt place”, has been the place to go for screen printed and embroidered tshirts, sweatshirts, hats, bags, jackets, blankets, and teamwear in New Milford and surrounding areas for over 30 years. As the premier supplier of any imaginable custom printed item, Fat City has provided consistently top level customer service and superior products to local businesses, schools, town government and families since 1980. We are a one-stop shopping experience! Our graphic design team is here to help you, whether you are designing a new logo for your business, a very cool tshirt for your soccer team or family cruise, or an innovative new twist on an old theme to put on water bottles for the next promotional event in town. Let us help you then find the perfect shirt... pen... magnet... travel mug... mousepad... bag... tool kit... measuring cup... sweatshirt... water bottle... hat... USB drive... calculator... keychain... jacket... dog leash... shot glass... notepad... uniform… etc... etc... etc to print or embroider your new art on. Our knowledgeable staff can guide you through the many options of sizing, colors, and layouts for results that you will be proud to use and hand out. Come visit us at — 99 Danbury Road (Route 7) across from Home Depot!